McCall’s 6613 has to be the most unique of the four patterns here. First of all, look at that cover photo. I think there’s something going on. I checked out “Fit for Real People” from the library recently, and though it definitely has some useful info I decided that the book, and the approach, were not my cup of tea. (That’s a topic for another post). But here, we’re looking at what this shirt pattern has to offer. 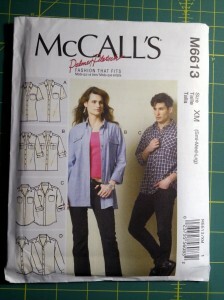 On the surface, it seems similar to McCall’s 6044, but there’s one big difference: this pattern is unisex! You can click or tap to see a larger photo. Here’s a shot of the shirt front piece, and you can see that it has a point for a bust apex, as well as two “Palmer/Pletsch” fitting lines which I think might be for dart placement. But I’m not sure. 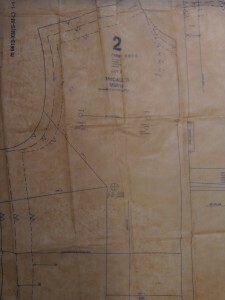 Here’s a portion of the back piece, again showing custom fit lines that can be used for swayback adjustment and other pattern fit modifications. 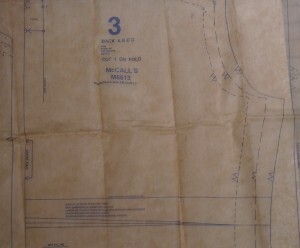 Like McCall’s 6044, this pattern also has a two-piece sleeve, this one with additional fitting lines that are part of the Palmer/Pletsch fitting system. Like most other patterns I’ve reviewed, this one also lacks a true tower placket, instead offering a “sleeve tab” to cover that area. Boo. Like Simplicity 2741, this pattern has a pretty simplistic collar that lacks an under-collar piece that’s slightly smaller than the top collar. Again, this pattern has the mysterious front band whose purpose I haven’t quite fully divined yet. I’m ruling this one out for now, on the basis of the placket and the collar. 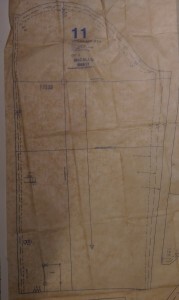 When I come back to this pattern, I might substitute a tower placket and tweak the collar construction. But I’m also a bit unnerved by the unisex nature of the pattern and I’d rather stick with a true “men’s” design for my first shirt-making attempt. 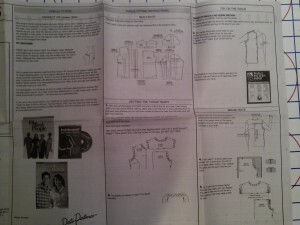 This entry was posted in Patterns, Shirts on December 31, 2012 by mportuesisf.